J’aime is Bastien’s dream ! J’aime means « love » in french. This is how every pastry is made, with love. 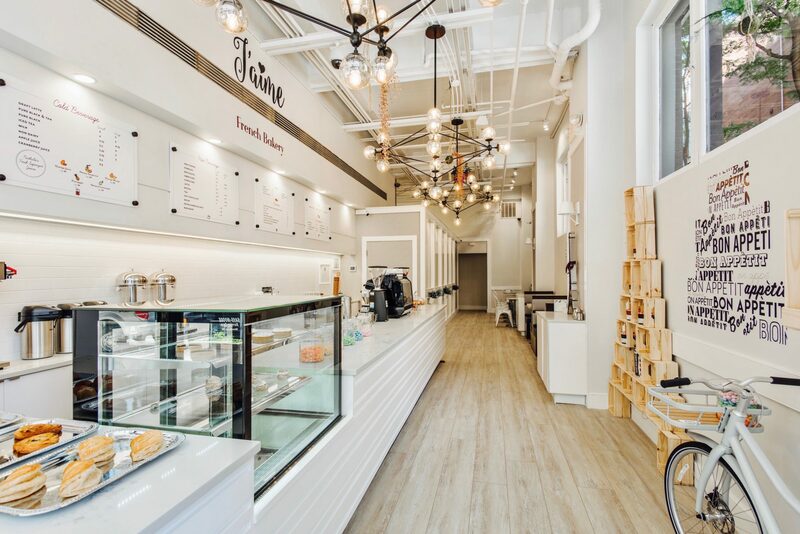 By coming to J’aime French Bakery, you will enter into a cozy and chic atmosphere, where everyone is welcome to share a dessert, small dish or beverage. Since he was a little boy the family tradition was to eat « crêpes » for dinner every Saturday. At the age of 10 Bastien’s father taught him how to make them. From that point on, his passion for baking grew. After graduating from high school in France, Bastien had the opportunity to spend a year in California as a foreign exchange student. Thanks to this experience, he discovered and fell in love with the American spirit. He also discovered the love Americans have for French food! When he returned to France it was important for him to attend business school to have a good foundation on how to run a business. However, he always had the intention of becoming an ambassador for French food and culture overseas. After working two years in an IT consulting company as a business manager, Bastien decided that it was time to follow his dream: he enrolled in one of the best pastry schools in France, LENÔTRE Pastry school, where he graduated with honors.